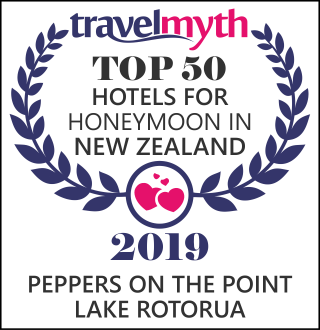 Peppers on the Point is an elegant lakeside lodge, steeped in the local history of love and life. With a beautiful waterfront location, rolling green lawn and an intimate chapel, it is the perfect venue for a sophisticated Rotorua wedding. The retreat is three hours south of Auckland and just five minutes from the heart of Rotorua. Perched on the shores of Lake Rotorua it has a relaxed and tranquil atmosphere ideally suited for a wedding of up to 70 people. The intimate nature of the lodge is truly unique and our experienced and dedicated wedding coordinator Leanne Gale will work closely with you to plan your wedding day and ensure everything runs smoothly. Leanne’s attention to detail, pleasant and reassuring manner defines her style. Leanne will be happy to assist you with all areas of planning your special day from Photography, hair and make up to music and entertainment. Charming and personal, Peppers on the Point provides privacy and exclusivity. If you book an Exclusive Use Package, you will receive the wedding nights accommodation in the Main Suite as our gift. Conditions apply. There are a number of picturesque settings for your ceremony and reception. The most enchanting venue is the stone chapel. Positioned above the lake this Rotorua wedding chapel boasts an impressive panoramic view spanning from Lake Rotorua to the historic Mokoia Island. Hold your reception in the stunning gardens, down by the lakeside or in an elegant function room. Fine dining is a feature of Peppers on the Point. Your wedding day will be unique, with menus created to your specific requirements and fine New Zealand wines. Any special dietary requirements can be catered for as well. The lodge can accommodate up to 30 guests in beautifully styled rooms featuring antiques and exquisite finishes. Wedding packages can be tailored to suit your requirements. I just wanted to say a big thank you to you and your team at Peppers for creating the most perfect day for us last weekend. Everything from the venue, the service and the amazing food has been the talk amongst our guests. Please send our thanks to Craig for creating beautiful dishes, our guests were in awe of how perfect each course was. The wait staff were also very tentative and helpful. Thank you for being a great help throughout the past year, for being patient and responding to my endless emails and also for being flexible for us to create our perfect wedding. We will not hesitate to recommend Peppers to any of our friends who will be getting married in the future and no doubt we will be back soon.